VF Corp looks set to grow further. 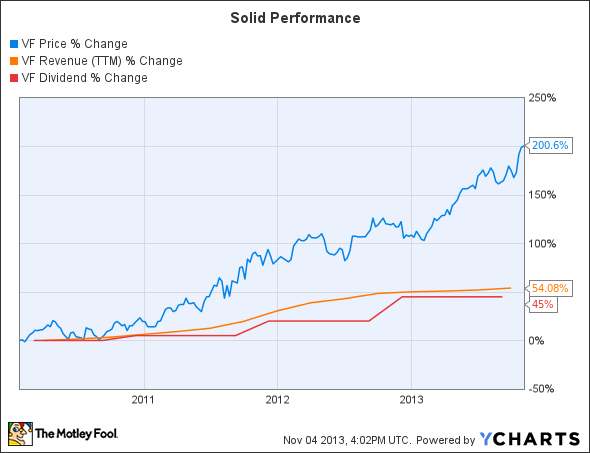 VF Corp (NYSE:VFC) has been a strong performer this year. Its stock price has risen around 43% year-to-date and a dividend yield of 2% makes the stock more attractive, but investors can count on the company to deliver greater returns in the future as well. The diversity of its product portfolio, which includes a mix of outdoor wear, sports clothing, footwear, and jeans-wear, has been an advantage for VF Corp. In addition, the company's global presence adds another tailwind. Throw in its portfolio of popular brands, and it isn't difficult to see why the company's revenue has been growing. VF Corp has proven a good long-term investment so far. Investors who had invested back in 2010 would now be sitting on gains of more than 200%. VF Corp's recent third quarter results further suggest that more upside could be in store. In the last reported quarter, it generated revenue of $3.27 billion, 5% more than the year-ago period . This was fueled by its strong performance in outdoor & action sports products and its international operations, as well as direct-to-consumer sales. The company's gross margin expanded by 90 basis points as compared to the year-ago period due to improvement in higher margin businesses, as well as lower product costs. As a result, earnings came in at $3.89 per share and beat consensus estimates. Acquiring companies and brands has been one of the drivers behind VF Corp's growth, much like PVH (NYSE:PVH). In addition, VF Corp has also been increasing its store count. In the third quarter 55 new stores were added, and management claims that this will be a record year for store openings. VF Corp is also aggressively pursuing the direct-to-consumer, or DTC, channel. VF Corp reacted to weak market conditions in Europe and America by investing in DTC initiatives such as e-commerce websites. This led to positive DTC comps in Europe and high-single-digit growth in the Americas. The DTC channel now accounts for 19% of revenue . These initiatives should help VF Corp going forward as it continues to invest in the DTC channel further. VF Corp's acquisition of Timberland should also help the company perform well. Timberland is VF Corp's largest brand in Europe in terms of sales. VF's revenue in Europe was up 2% in the previous quarter, but if we exclude Timberland's negative impact, revenue would have been up 8%. Hence, as the Eurozone slowly moves out of recession , Timberland should get stronger and VF Corp will benefit. Moreover, Timberland also has presence in emerging economies such as China and Turkey. VF Corp plans to generate 45% of its revenue from international markets by 2017. Not being restricted to one or two countries gives VF Corp the leverage necessary to keep performing well despite a slowdown in consumer spending in any given region. (1) The global jeans-wear market is forecast to grow by $10 billion in the next six years, fueled by growing demand in the emerging markets and resurgent western economies . (2) The global market size of performance sportswear is expected to grow to $7.6 billion by 2014 . (3) The global sports and fitness clothing market is projected to reach $126.30 billion by 2015 . (4) The global athletic footwear retail industry is anticipated to reach approximately $51 billion by 2017 . VF Corp's presence in important markets globally allows its different segments to take advantage of global growth opportunities when these opportunities come. VF Corp does have some competition. PVH, like VF Corp, owns a multitude of brands in different segments and operates globally. PVH has also been growing through acquisitions, with the latest acquisition being The Warnaco Group earlier this year. This was one of the drivers behind PVH's year-over-year revenue growth of 47% in the previous quarter. Also, the acquisitions of Speedo, Warner's, and the Olga women's intimate apparel businesses by PVH led to an increase in revenue from its Heritage Brands segment by 36.2% year-over-year. On the back of strong revenue growth and improved margins, PVH reported earnings of $1.39 per share . The global men's wear market is expected to reach $402 billion by 2014 , with about 35% of this growth coming from the Americas. Also, the home decor market in the U.S. is expected to reach $38.6 billion in 2016 . PVH, through its different segments, is in a good position to tap into these expanding markets. Recently, Tommy Hilfiger (a subsidiary of PVH) signed a licensing deal with LF USA to bring home decor products to the Americas. Another peer is Jones Group (UNKNOWN:JNY.DL), which designs and markets wholesale apparel, footwear, and accessories under brands like Nine West, Jones New York, Anne Klein, Kurt Geiger, Rachel Roy (L), Robert Rodriguez, etc. However, it is in the midst of a restructuring, so it isn't a star performer like the others. It is also relatively smaller in market cap than the other two. In the third-quarter, Jones Group had a 1.25% year-over-year decline in revenue to $1.022 billion. Its earnings per share came in at $0.48 which compared to a gain of $0.57 in the year-ago period. With a weak environment in apparel and accessories retail, a turnaround for this company looks difficult for the time being. Jones' expected earnings growth for the next five years isn't rosy either. Analysts expect earnings to grow at a compound annual growth rate of just 1.65%. Investors looking for a strong play in apparel retail should consider either PVH or VF Corp for their portfolios. VF Corp is a Dividend Aristocrat and its yield surpasses PVH's 0.10% by a big margin. VF Corp's strategic moves further indicate that the company is positioning itself to profit from industry growth in the future. Hence, the bullish case for VF Corp looks stronger than the case for its peers.